Ask fellow campers about "Deer Ridge Camping Resort" and nearby attractions. Very clean, very friendly, enjoyable relaxing campground. Highly recommend Deer Ridge to all campers. Mostly has back in sites and just a couple pull thrus. We had a great pull thru for our 35' fifth wheel and 4 granddaughters ages 9-14. Reasonably priced-Passport America Discount. 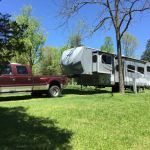 We camped at Deer Ridge Camping Resort in a Fifth Wheel. We spent two nights here while visiting a nearby RV dealership. We paid $4 over the standard Passport America rate for 50 amp and another $4 for a pull thru site since we were unable to get our 40' rig into one of the back-in sites due to the narrowness of the road. The roads are narrow gravel with some fairly tight turns but we were able to get around with no problem. The utilities worked fine and we were able to pull in several channels by the antenna. There is no wi-fi at the sites, only at the office. The owners were friendly and helpful. The restrooms and showers were old but very clean and well maintained. 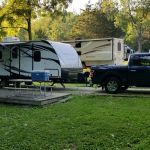 We camped at Deer Ridge Camping Resort in a Fifth Wheel. We wanted to visit Tom Raper RV since we had been seeing signs for it for years. We understand that Mr. Raper passed away and it is now Camping World. Small shady park utilized by some long-term occupants. There are only 2 pull through sites, WiFi is only available at the office, and no cable. Friendly office personnel. We camped at Deer Ridge Camping Resort in a Motorhome. I made my reservations the first week of May for two sites for an overnight stay in mid July. I was told there was a Model T event in town but that they could give me two back in sites together. When we arrived they said we only reserved one site. They were still able to get both of us in but we weren't together. The owner seemed happy to give us the military discount without any proof. I don't remember the actual cost with the discount but I believe it was close to $30. We were on the lower pull through site which has a deck and very large grassy area. My parents were on site 46 which was small and mostly gravel. The campground is very woodsy with little grass. The sites vary greatly in size so check out the campground map. My parents had an incident with their camper on the way and the owner did try to be very helpful, suggesting places to call and even checked with us before we left the next day. We camped at Deer Ridge Camping Resort in a Travel Trailer. It's a very quiet campground. At least 40% of the campers there are seasonal. Very shaded if that's what your looking for but if you want activities such as trails etc., this isn't your place. If you wanna go and kick back, then a decent place. We camped at Deer Ridge Camping Resort in a Travel Trailer. Run down. Dumpster overflowing when we pulled in at the beginning of the weekend. Nothing mowed or kept up. Store/rec area dirty. We camped at Deer Ridge Camping Resort in a Travel Trailer. Careful of the Richmond 2018 Travel Guide! Some of the businesses are no longer open and/or hours are wrong. Also, bypass the Richmond Welcome Center if you're going for the free Passport to Savings/discount coupons/savings because they still haven't come in (at the end of June!). Just an overnight stop on the way home. Be careful coming and going as entrance is tight. Upper pull-thru took some leveling but worked out OK. Check in lady was kind of grouchy. They have a military discount & when I asked I got a hard look & "Can you prove it??" I don't carry a copy of my DD214 but finally convinced her to take my American Legion membership card after another hard look. Interior roads tight. Won't stay here again. We camped at Deer Ridge Camping Resort in a Fifth Wheel. Campground is mostly seasonal sites but has a couple of pull-throughs for overnighters. Our pull-through site was moderately unlevel front-to-back but good side-to-side. Trees blocked our satellite dish and this is probably the case for all of the campground's sites. Fair Verizon signal. No cable TV. No broadcast TV. Campground was clean and well-maintained and the staff were friendly and helpful. Interior roads were narrow with tight turns but with some care I was able to get through without scraping the sides of our motor home. We camped at Deer Ridge Camping Resort in a Motorhome. Nice family oriented, family owned park nestled amongst the trees with plenty of space between sites. Quiet, well maintained, and super nice owners. Sites gravel and grass, mostly level. Road noise minimal. Amenities include pool, playground, micro-golf, dog run, pavilion, book exchange, and gift store. Didn't use bathrooms or showers or laundry. Local area brochures on display near office. Made reservation for one week, ended up staying for almost three. Close to historic downtown Richmond. Firehouse BBQ and Blues is a good place to stop in, across from the Model T Museum. 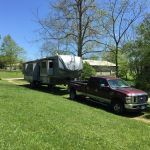 We camped at Deer Ridge Camping Resort in a Fifth Wheel. Less than 5 miles from downtown Richmond, IN and its historic district. Blues historic sites, Model T Museum, and Railroad memorabilia. Kroger, Lowe's, Kohl's, Menard, CVS and everything else you'd need close by. Perfect overnight stop, we stayed in a pull-thru and found it easy to navigate the park. We camped at Deer Ridge Camping Resort in a Motorhome. Lovely and quiet park. Nice pool. Mini golf. Small store. Beautiful setting. Tiny catch and release pond. Playground. Lots of long term folks from what we could tell. We camped at Deer Ridge Camping Resort in a Fifth Wheel. Nice shopping nearby. The only thing to be wary of is they only have two pull thru sites. Still a great quiet overnight stop. We'd stay here again. We were in a pull thru site but would have preferred back in site in a grassy area with fewer trees. One lane road in and out of park could be a problem if meeting an oncoming vehicle. Some permanent sites but they are well maintained. Park is well maintained, lots of things to do and restrooms are very very clean. Passport rate is cash only. We camped at Deer Ridge Camping Resort in a Motorhome. Since we were using Passport America we had to use a back in and had to unhook our tow. The site was a little unlevel and would have been a mess if it had rained, there would have been a lot of mud. The owners were very nice and helpful, plenty of trees and several wood carvings that are beautiful. It wasn't too far off the road so it was fine for overnight. The wifi worked in their barn (rec room) and was fine. We camped at Deer Ridge Camping Resort in a Motorhome. We enjoyed camping here so much we extended our stay. The campsites are relatively spacious and the campground has lots of trees. We were here in early June, and the fields and trees surrounding the campground were filled with fireflies at night; it was lovely. The campground owners are very friendly and accommodating. In addition to providing fire rings and picnic tables with care to level the table, they also recommended events and museums in Richmond which were delightful. 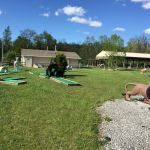 We travel with two dogs, and the campground is very pet friendly and has a small fenced dog run for dogs to be off-leash. The pool looks inviting and clean, and although it was too cold for us Floridians to swim, others were enjoying the pool. The campground is conveniently located just off I-70, but there is no highway noise in the campground. We camped at Deer Ridge Camping Resort in a Motorhome. Campground owners highly recommended the Wayne County Museum. We so enjoyed that museum founded by Julia Meek Gaar and highly recommend it ourselves. If you want to see everything, plan to spend several hours. We also enjoyed the Model T museum and Historic Downtown Richmond and the Gaar Mansion. The rate reflects a Passport America discount but extra charges for a pull-through, 50 amp, pet, and taxes. This was a 1 night stop over for us. I wish we had just kept driving and pulled into a rest area. The lady at check-in was nice. The site was awful. It looked like it was in a ditch. There was a rising hill with a tree on one side and a wooden platform on the other. We eventually had to pull around and back into it. We had 50 amp and full hook-ups but we were dirty and muddy by the time we finally could settle in. We camped at Deer Ridge Camping Resort in a Motorhome. Are you affiliated with Deer Ridge Camping Resort ?